There is a youth movement on the culinary scene in the British Virgin Islands (BVI). 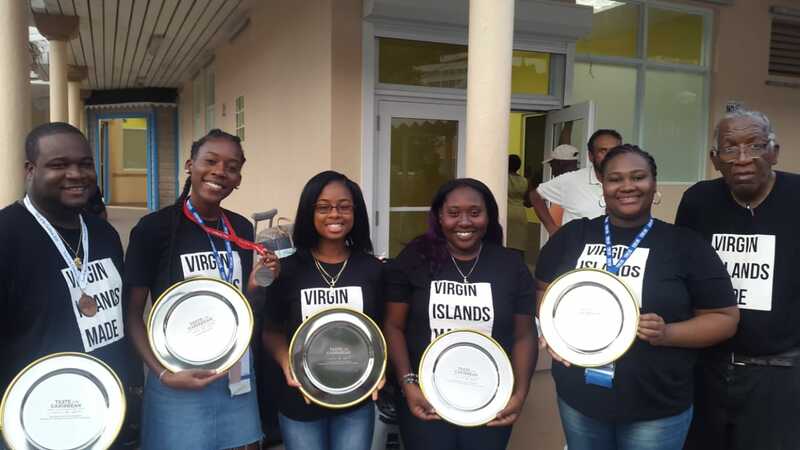 The BVI National Culinary Team with an average age of about 22 years, proved their mettle against their regional counterparts as they returned this week from the annual Taste of the Caribbean Competition with several accolades from the event. This renowned celebration of Caribbean Cuisine is hosted by the Caribbean Hotel and Tourism Association (CHTA) and took place in Miami from June 22nd– June 26th. 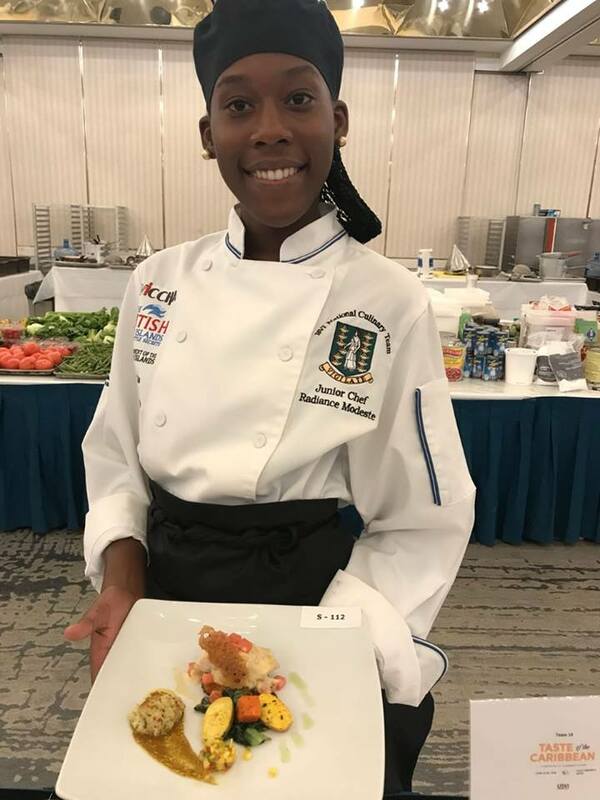 Radiance Modeste, a native of Virgin Gorda and a student at the Virgin Islands School of Technical Studies, took the top prize as the overall winner of the Seafood Competition. At 17 years of age, Radiance was reported to be the event’s youngest competitor. Ariq Flax Clarke, also a Virgin Gorda native and a student at Johnson & Wales School of Culinary Arts – North Miami Campus, gained a silver medal in the Junior Chef of the Year Competition and an honourable mention in the Certified Angus Beef Competition, while his schoolmate, Lakesha Barry, received an honourable mention in the Chocolate Competition. Everson Rawlins, a local bartender, took home the bronze medal in the Bartender of the Year Competition. Radiance and Ariq have the distinction of being former winners of the BVI Tourist Board Junior Chef Competition, who both travelled with the BVI Tourist Board to the prestigious Mid-Atlantic Food & Wine Festival in 2015. Chef Ariq also teamed with Lakesha Barry to attend the South Beach Wine & Food Festival (SOBEWFF) last year. Chef Lakeisha King, who will commence studies at Johnson & Wales University’s Rhode Island Campus next month. The Caribbean 305 showcase is described as the biggest Caribbean Celebration in Miami and the only event where guests can enjoy the cuisines of 17 Caribbean destinations in one night. Open bar, unlimited tapas style dishes, music, entertainment make this the event to attend in Miami. Taste of the Caribbean is the region’s premier culinary competition, food and beverage educational exchange and Caribbean cultural showcase. Since 1993, the Caribbean’s best chefs and culinary teams unite at taste to compete, demonstrate their skills, learn from each other and offer the general public a scintillating exhibition of the most delectable culinary treats of the islands. Taste provides a forum for food and beverage professionals to gather practical information, develop skills, sample and purchase, strengthen and establish supplier relationships and meeting new vendors. Participate in innovative and exciting educational sessions to enhance individual skills and increase the value of their craft. 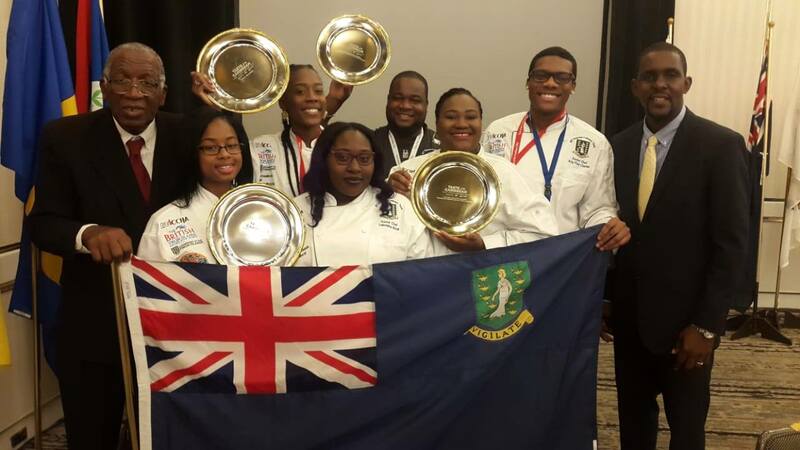 The BVI National Culinary Team continues to showcase their talent, whiles representing the Territory as culinary tourism ambassadors. The team returned to the Territory on Wednesday, June 27th. Known as a treasured destination rich in undiscovered experiences, the British Virgin Islands (BVI) is an alluring archipelago comprising 60 islands and cays located 80 kilometers (60 miles) east of Puerto Rico, in the northwestern region of the Caribbean Sea. The main islands of Tortola, Virgin Gorda, Anegada and Jost Van Dyke have attracted travelers globally with their cultural Caribbean authenticity. Located in Tortola, Road Town is the BVI’s capital. Ranked #1 Best Place to Visit in the Caribbean by U.S. News for two consecutive years in 2017 and 2018, the BVI is where nature’s best secrets are kept with an abundance of pristine beaches, azure seas, towering sage mountains and burnt-orange sunsets. It’s no wonder the BVI’s Virgin Gorda and Jost Van Dyke were featured on the “Top Islands in the Caribbean, Bermuda and the Bahamas” list in Travel + Leisure’s World’s Best Awards 2017. The BVI Tourist Board invites everyone to experience the tropical mystique of the Territory’s unparalleled and enriching offerings. For more information, visit www.bvitourism.com.